Rydges Horizons Snowy Mountains - Apartment 221 is a very comfortable Studio which offers beautiful views over Lake Jindabyne - fish, ride your bike or walk the lake front walking track. Newly re-furbished this apartment now shows a modern finish. Enjoy the view with a glass of wine or beer on the outdoor setting on the balcony. Enjoy a morning coffee with your view of the mountains and the lake so close you can touch it! You will be relaxing on the comfortable lounge with Digital flat Screen TV and DVD player with USB plugin - so bring your favourite dvd's or laptop.Stay warm in winter or cool in summer with the reverse cycle air-conditioning. There is NO WiFi at the unit although you can access your own data allowance. With a fully equipped kitchen with microwave, dishwasher, stove and oven self-catering is easy. You can order 22gb of Telstra 4G Mobile with a Broadband Wi Fi Modem with your reservation at this property. Please refer 'Options' List when you make your reservation. The bathroom/Laundry includes an over the shower bath, drying cupboard, plenty of storage, full size washing machine and dryer. Deluxe bathroom products are supplied as well as a hairdryer. Rydges Horizons Snowy Mountains offers guests the use of an indoor heated salt water pool, tennis court, games room, licensed restaurant, on site masseuse, casual bar, bistro and more for your comfortable year round holiday. Horizons 221 comes with a garage for 1 vehicle. Only a 3 minute walk to Nuggets Crossing Shopping Center and the nearby restaurants, bars, retail shops and Woolworths supermarket. Balcony with the Lake so close you can touch it! There is no free WiFi but you can order a Mobile Broadband WiFi modem preloaded with 5gb with your reservation. Alternatively you can use your own data allowance. Nice unit, as advertised. Great Views. Good to have a garage. 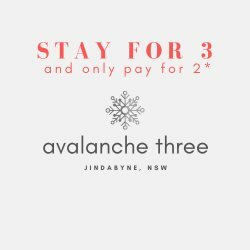 Resort facilities excellent and close to Jindabyne shops. Thanks! Peter and Joan was a great contact for the property, and the after hours check-in and check-out options were really handy. A warm room with a nice view over the lake, and walking distance to shops! We spent wonderful week in this apartment and I like everything in it! Especially that kitchen contains literally all things one can even think of, even food containers, rice cooker, blender and so on. As we were there in winter, for me was very important that it was very warm inside and in the bathroom was a heater, what is really great when you need to bath a baby. Staff was very friendly and helpful, responded quickly on each request! I was really suprised to find everything one could even think of to use in apartment. I felt like at home, everything I needed was there, like plastic boxes for food, or blender, or rice cooker. It was very handy. Very clean apartment with a great location and view. The team is amazing and super friendly! Loved it overall! Will be back! It was a pleasure to converse with Peter Bird about our experience. 50% Deposit is required with booking, final & full payment is required 60 days before arrival date or you're booking may be canceled as an unpaid booking and could be re-booked by another guest. You will receive emails before this happens so please ensure that your email address is correct at all times.